Being a son of Lucknow allowed me to appreciate all the religions and their shrines right from the childhood. I take pride on the fact that I have developed a knack of finding art in religion over the years. So visiting Jaipur and going to Jagat Shiromoni Temple was a natural choice for me along with my travel buddies. Situated behind Amer Fort in Jaipur, the USP of this temple lies in that fact that- there is no entry fee for the devotees. Much I like Jaipur and its hottest tourist attractions; somehow I found most of them too much crowded with tourists all the time. But to my relief, the premise of Jagat Shiromoni Temple was almost empty barring few locals when we got there. Another point I liked that- there was no line of devotees and the pujas were done in a most organized way which is a rare sight in any other famous temple in India. Constructed between 1599 AD to 1608 AD; Jagat Shiromoni temple is the living and loving proof of a mother’s affection to her child, as it was made by Queen Kankawati Devi in the honor of her son Jagat Singh. I didn’t know about my friends but what I liked most about Jagat Shiromoni Temple was- the gorgeous combination of black-and-white marble as well as sandstones that went into its making. On the other hand, the giant depiction of trumpeting elephants and horses made my heart skip a bit. Though the temple is dedicated to the idols of Radha-Krishna, for the locals it’s primarily known as Meera Temple. When we entered into the temple compound around 7 AM in morning, the stunning beauty of the temple bathed in the wintry morning sun cast a dream-like spell on us. I spotted excitingly that the edifice of this place of worship had much resemblance with South Indian style of architecture, and again it proved the fact that- India is truly diversified. 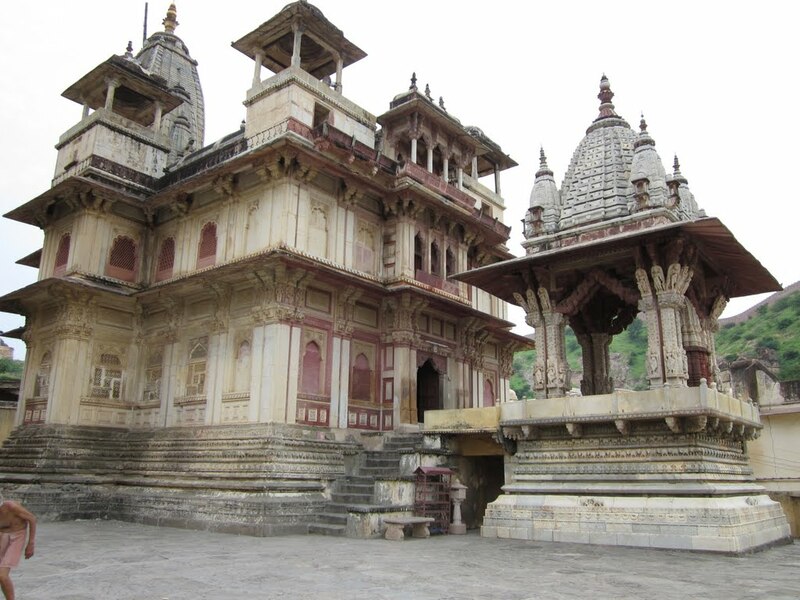 .Initially Jagat Shiromoni Temple was not on our itinerary. It was a last minute addition. But later we felt glad that we made the right decision of stopping by this temple.